With the Beanpot, since 1952 the emblem of the college hockey championship of Boston. 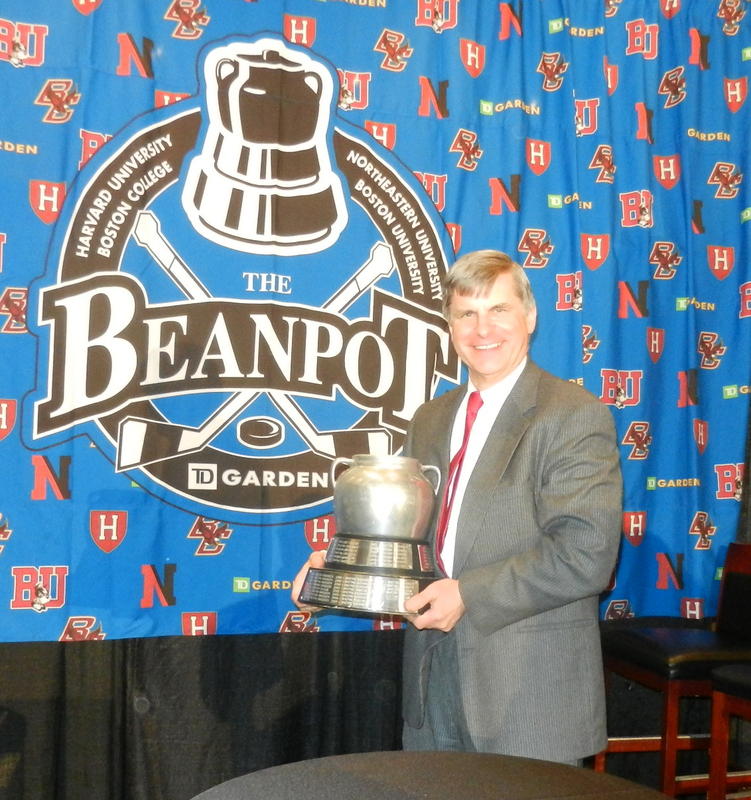 Speech by Tom Burke, Assistant Secretary of the Beanpot College Hockey Tournament, at the press luncheon at TD Garden, January 28, 2014. Today I have the honor of introducing the Beanpot Hall of Fame Class of 2014. We have just one inductee. Lane MacDonald, Harvard University, Class of 1989. And where to begin? Well, knowing a bit about Lane, I think he’d rather I speak of teams, and lines, and other people. So I’ll start there. A couple of years ago the Massachusetts Hockey Hall of Fame enshrined an entire Harvard line that we all know as the Local Line. Three Massachusetts kids named Corkery, McManama, and Hynes who terrorized opponents for three seasons in the early seventies. It was possibly Harvard’s best line ever. When I raised that subject with Lane, and asked him about his own line, he said that that Harvard’s best lines were whichever ones had Joe Cavanaugh or Bill Cleary. But if you know your Harvard hockey history, or if you just remember the fabulous season of 1988-89, you might just cast your vote for the line of Lane MacDonald, Alain Bourbeau, and C.J. Young. 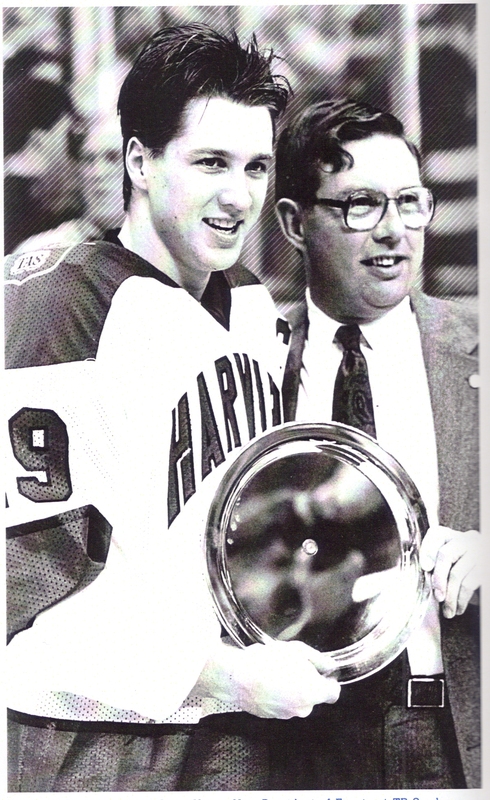 Lane MacDonald accepts MVP trophy from Garden VP Steve Nazro after Harvard defeated BU 9-6 for the 1989 Beanpot title. Lane was the team captain that year. Harvard had a record of 31-3. They won the Beanpot. They won the NCAA championship. Lane was the MVP in that Beanpot. He’s tied for third place in all time Beanpot scoring – 15 points, same as Art Chisholm of Northeastern, Vic Stanfield of BU, and Billy Daley of BC. Many of you here remember Lane’s father Lowell. He had an 18-year professional career that began back in the days of the six-team National Hockey League. Lowell for the Red Wings, the Kings, and the Penguins. One of his teammates on the Pittsburgh Penguins was Bobby McManama, one of those guys on the Local Line that I mentioned a minute ago. Bobby came to the MacDonalds’ for dinner one night, and that meeting got Lane thinking about going to Harvard. That’s where he ended up, and what a career it was. He’s Harvard’s top goal scorer of all time with 111. He had 12 shorthanded goals – the next player on the all-time list has 7. The only man who scored more goals than Lane in a single Harvard season is with us today – his coach Bill Cleary. I’ve mentioned that Lane was captain of the NCAA champions of 1989. The MVP of that championship tournament is here too – coach Ted Donato. Lane also played for the 1988 U.S. Olympic team in Calgary before he returned to Harvard for his final season. After Harvard, a pro career didn’t happen. Lane played in Switzerland and helped coach at Harvard for a year. But his playing career was cut short due to recurring problems from head injuries he’d suffered along the way. Lane then entered the investment banking field, earned his MBA at Stanford, and now he’s a managing director at Harvard Management Company. Those are the financial guys who take care of the school’s endowment. So Lane is still scoring goals for Harvard. And membership in the United States Hockey Hall of Fame. But now, as we of Beanpot Land all would agree, he is in truly distinguished company. He’s the newest member of the Beanpot Hall of Fame. Lane MacDonald. Few places on earth can compare with Normandy in France. Can you imagine a scene as placid and peaceful as this one? 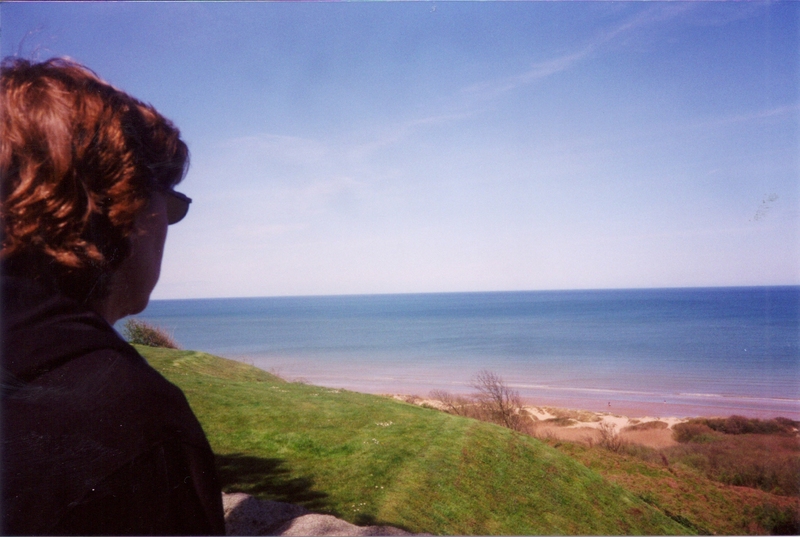 In the first photo, my wife Mary Ellen gazes over the bluff and down onto the beach at Colleville sur Mer. Such quiet, such tranquility. It was not always this way. This is near the eastern end of the shore section code-named Omaha Beach on D-Day in 1944. That June 6 it was anything but placid and peaceful, as American soldiers waded slowly onto the shore and into cataracts of bullets fired by unseen enemies high above. As one proceeds to the west, the bluff rises higher and steeper and gives an even stronger advantage to entrenched defenders. 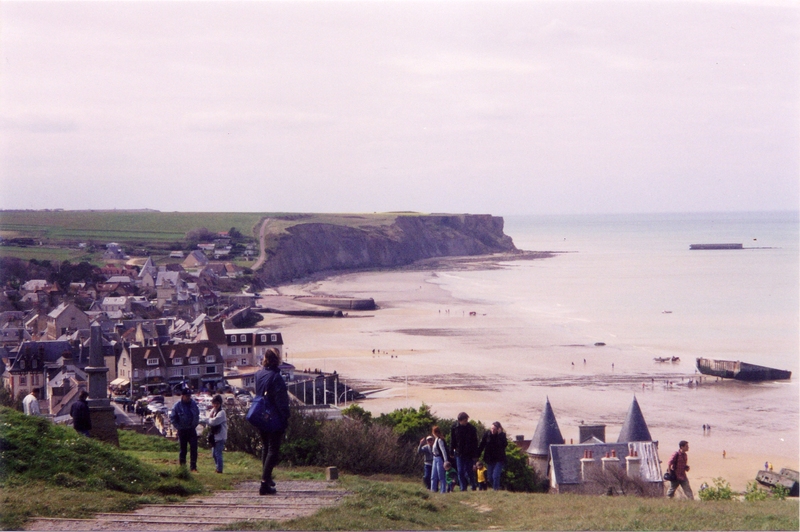 The second photo is of Vierville sur Mer, on the western end of the Omaha Beach sector. The large objects in the water there are the remains of “mulberries,” the artificial docks that were needed to bring trucks, tanks, and other mechanized equipment to the land. Vierville sur Mer, France, the westernmost part of Omaha Beach. Beyond Vierville is Point du Hoc, the high vertical cliff that Army Rangers scaled with the aid of extension ladders from the London Fire Department, and the beach code-named Utah. Such a flood of emotions gripped me on our trip there in 2000: patriotic pride, and gratitude and admiration for those who came ashore and somehow, some way, prevailed in the end. But most of all, it was sadness, an overwhelming sadness for all those young men from Canada and Britain and America who suffered so much that day and did not return. “No one can tell the whole story of D-Day because no one knows it. Each of the 60,000 men who waded ashore that day knew a little part of the story too well. To them, the landing looked like a catastrophe. “Each knew a friend shot through the throat, shot through a knee. Each knew names of five hanging dead on the barbed wire in the water 20 off shore, three who lay unattended on the stony beach as the blood drained from holes in their bodies. They saw whole tank crews drowned when the tanks rumbled off the ramps of their landing craft and dropped into 20 feet of water. “There were heroes here no one will ever know because they’re dead. The heroism of others is known only to themselves…On each visit to the Beaches over the years, I’ve wept. It’s impossible to keep back the tears as you look across the rows of markers and think of the boys under them who died that day. Mr. Rooney is so right. When I came across these pictures today, almost fifteen years after standing there in Normandy and taking the pictures, I felt those tears welling up once again. I think that every American should make the pilgrimage to Normandy at least once in his or her life. That’s what it is. It’s not a trip. It is a pilgrimage to holy ground. You are currently browsing the Veteranscribe's Blog blog archives for January, 2014.